Christians in Sabah and Sarawak have been complaining about surreptitious conversion of Christian natives for twenty over years, but to no avail. Islamic proselytizing and conversion of Christians have become more flagrant than ever. Perhaps, the authorities perceive that many Christian natives, especially those in the rural areas, will not go beyond complaining (or groaning) as poverty renders them vulnerable to inducement that accompanies conversion to Islam. Indeed, some natives may not mind their children converting to Islam when they marry a Muslim as this would open opportunities for social mobility and uplift. 1) Systematic and comprehensive Christian education to build up the faith of believers, especially Christian parents whose children are targeted when they attend the tadika-taska (Islamic kindergarten-nursery) set up government agencies. 2) Initiatives in economic empowerment that include assisting economic micro-enterprises, organizing economic cooperatives among the Christian villages, and creating SMEs that would provide jobs for the semi-rural Christians. 3) Mobilizing churches and NGOs to hold their wakil-wakil rakyat accountable for their failure to prevent conversion to Islam through economic inducement. The Christian natives are literally overwhelmed by Islamic proselytization programs that are funded by vast government resources. Will Peninsular Malaysian Christians readily share resources with their besieged brethren as they face an unprecedented threat to the existence of the East Malaysian church? We trust that if the protestors were to understand the true meaning of the cross – regardless of whether they agree with the rest of the Christian faith or not – they would not perceive it as anything other than a symbol of the love and mercy of God. The cross is also a symbol of humility and forgiveness, and could and should never be conceived as a challenge or provocation in any way, shape or form. 1. We are disturbed, and saddened, by the protest by a group of people on Sunday, 19 April 2015, at Taman Medan, Petaling Jaya, Selangor, against a church which has been in operation since August 2014. It was also reported that the protestors had demanded that the cross be removed from the church because it was perceived as “challenging Islam” in the predominantly-Muslim neighbourhood. 2. We are disturbed, because we believe that this latest episode of religious tension is a symptom of the deterioration of religious harmony in Malaysia. Never before has our multi-racial and religiously diverse nation faced so much anger and intolerance. 3. Yet, at the same time, we still maintain our conviction that such hatred and provocative actions by a handful of extremists are certainly not representative of the Malaysian society as a whole, and that the overwhelming majority of our Muslim brothers and sisters strongly uphold the true Islamic value of respect and tolerance towards other religions and their places of worship. 4. It goes without saying that it is the constitutional duty of the authority to guarantee that non-Muslims could practice their religions in peace and harmony (Article 3(1) of the Federal Constitution). Such duty extends to protect not just the many in a cathedral, but also every small congregation of the few – Indeed, especially the small congregations of the few. – As all Malaysians, Muslims or non-Muslims, Kelantanese or non-Kelantanese, are rightful stakeholders in the enforcement of KSCC, no one should be penalised, threatened or ridiculed for having or expressing any opinion on the matter. – The success of Islamic banking in winning over the hearts and minds of non-Muslims through rigour and proven benefits, rather than a deceiving assurance of non-Muslim exclusion or a sloppy “trial-and-error” attitude, should be an inspiring example. – The implementation of KSCC must not be decided on a winner-takes-all manner, such as a simple majority in the Dewan Rakyat, for this will risk tearing the country apart. – The inclusive spirit of the Federal Constitution and the 1963 Malaysia Agreement, which lay down the secular basis of the Federation of Malaysia, must be upheld. First, the provisions of the Kelantan Syariah Criminal Code is so evidently ultra vires the Federal Constitution that there is a prima facie case to reject it out of hand. It is agreed that the call for rational dialogue should not be restricted to debating whether one should support or oppose hudud. It is a call to all Malaysians to respect the provision related to the status of Islam and other religions in the Federal Constitution which is premised on a secular framework. Put concretely, the starting point for dialogue should be the original intent of the Federal Constitution as a secular-state where there is no establishment of religion, or provision for a dominating position for Islam. In this regard hudud or any Islamic law should not be part of our legal system, except in matters of personal law specifically enumerated in the Constitution. See related post: Malaysia Social Contract (Part 1): Religion and Equal Citizenship and Historic Documents on the drafting of the Constitution. Second, the rational debate should publicly call into question not only the overt hudud agenda of the Kelantan government, but also the arguably, clandestine introduction of syariah compliant provisions in various State enactments in UMNO dominated State Legislative Assemblies (Dewan Undangan Negeri), and imposition of syariah compliant policies in the government departments affecting non-Muslims. Hudud naturally elicits strong and vocal opposition from all reasonable Malaysians as its implementation is an obvious and undeniable act of injustice against non-Muslims. In contrast, the introduction of syariah compliant laws and department policies are subtly and incrementally implemented so that non-Muslims remain unaware of the gradual erosion of their fundamental liberties. In either case, the inclusive spirit and universal justice enshrined in the Federal Constitution would be shattered by the fatal blow of hudud, or gradually extinguished by the covertly introduced syariah compliant laws of the State Legislative Assemblies and government department policies. The Bible Society of Malaysia (BSM) is demanding an apology from the Selangor religious authorities over the “desecration” of Bibles which were stamped following their seizure earlier this year. The move comes as The Malaysian Insider reported this morning that Christian leaders were furious that the Bahasa Malaysia and Iban-language Bibles were stamped with a warning (pic, below) that they were not to be published or used anywhere in Selangor, prior to the release of the books to Sarawak Christians last month. 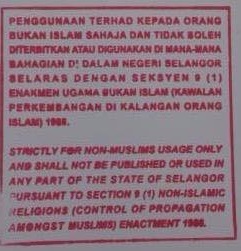 [Note on the stamp – In English, it reads: “Strictly for non-Muslims usage only and shall not be published or used in any part of the state of Selangor pursuant to section 9 (1) Non-Islamic Religions (Control of Propagation Amongst Muslims) Enactment 1988”]. BSM president Bishop Datuk Ng Moon Hing said the stamping of the Bibles was contrary to Putrajaya’s assurance that such an incident would not recur, following a similar incident in 2011 in Sarawak. 7 AND WHEREAS the proliferation of oppressive laws that violates our fundamental civil liberties continues unabated, the legislative, executive and the judiciary must take urgent measures to remove such offensive laws and selective prosecutions and to restore just, fair, and democratic principles of governance as envisaged by the framers of our Constitution and our founding fathers. 12 AND WHEREAS Islam is the religion of the Federation but other religions may be practised and people of other faiths shall have the constitutional right and freedom to profess, practise, propagate, and manage their respective faiths without interference and intervention by the State. 13 AND WHEREAS the Constitution provides for laws to be enacted for the administration of Islam, such laws shall not be applied to non-Muslims nor non-Muslims be subject to Shariah law. 14 AND WHEREAS freedom of religion is guaranteed by the Federal Constitution and set out in the first of the 18 and 20-point conditions of Sarawak and Sabah respectively to be part of the Malaysia Agreement, but the legislative, executive and judiciary have persistently and wilfully trampled upon such rights of people of other faiths by making laws and decisions that militate against such freedom. The prohibition of the usage of the word ‘Allah’ by Bumiputera Christians to refer to the one true God and the restricted ban on the use of the Alkitab, the Malay language Bible, since the early 1980s are instances of gross violations of human rights. 19 AND WHEREAS there are extremist dakwah elements who undertake aggressive Islamisation by both covert and overt means to convert Bumiputera Christians through intimidation, deception, or inducements particularly targeting remote and poor villagers as well as conversions of school children living in government hostels. The National Registration Department despite its denials are also classifying native Christians with ‘bin’ or ‘binti’ in their names as Muslims in their MyKad without their knowledge or consent. Such unlawful and oppressive practices must stop immediately. When Juinah binti Paulus, a native Christian, went to the National Registration Department (NRD) to get her new identity card, the NRD changed her religious identity to Islam without her knowledge nor consent. This is not unusual. Many native or bumiputera Christians in Sabah and Sarawak with bin (son of) or binti (daughter of) in their names, are automatically classified as Muslims in their identity cards, known as MyKad. Once this is done there is virtually no remedy, except to wait in an administrative purgatory. The Kuala Lumpur High Court has ordered the Home Ministry and government to return the eight Christian religious CDs with the word “Allah” that it seized from Sarawakian Christian Jill Ireland in May 2008. However, Justice Zaleha Yusof declined to rule on the constitutional prayers under Article 8, 11, sought by Jill. Justice Zaleha ruled that the senior authorised officer from the Customs Department Suzana Muin, who issued the seizure order, had acted illegally in withholding the CDs as such powers lie with the home minister. She held that the respondents had acted in error of the law under Section 9 of the Printing Presses and Publication Act 1984, by withholding the CDs. “Suzana acted ultra vires as such detention (of CDs) must be authorised by the minister himself and is not delegated to anyone else. Lim pointed out that the supremacy of the constitution and the rule of law appear to have been seriously subverted and transplanted by the alien doctrine of supremacy of the religious bureaucracy and the rule and dictates of the religious authority…the involvement of JAKIM, the federal Islamic Development agency, brings another objectionable feature of the administration of the Printing Presses and Publicatins Act 1984 (PPPA) by the minister and government into focus. “There is clear evidence of surrender of discretionary power to an extraneous third party. As noted above, one of the three (3) grounds cited is “Melanggar Garis Panduan JAKIM”. Here we have a department which is not vested with any lawful authority in the administration of the PPPA dictating and directing how an officer under the PPPA is to exercise his powers,” he said. “Are we a nation governed by rule of law or religious bureaucracy?” – See more at: http://www.themalaysianinsider.com/malaysia/article/even-the-quran-says-allah-used-by-christians-and-jews-high-court-told#sthash.WY5kyjbV.dpuf“It is submitted that viewed objectively it is evident that rather than exercising an independent statutory discretionary power, the Minister had acted under the dictation of JAKIM.”. He also said the Respondents who are Federal Government and a Federal Minister have taken upon themselves the constitutional power to control or restrict propagation of religious doctrine or faith among Muslims. This is a jurisdiction vested in the various state legislative assemblies pursuant to Article 11(4) of the Federal Constitution. “The Respondent’s action constitutes an act on the part of the Federal Government and its officials using the PPPA to enforce the several state enactments controlling and restricting propagation. Enforcement of the enactment with regard to Selangor is by “authorized officers” appointed by the Ruler in Council. This is tantamount to a collateral use of the PPPA by federal agencies to enforce state enactments which are for the states to determine and not the Federal Government. Thus, the disputed decision constitutes not only unlawful and unconstitutional usurpation of state powers under the guise of the PPPA but also a colourable excuse and collateral use of the PPPA,”Lim said. The civil High Court has a higher jurisdiction than the syariah court on the religious dispute of a spouse who does not convert to Islam, the High Court in Ipoh ruled today. In giving convert father K Pathmanathan @ Muhammad Ridhuan Abdullah one week to return his six-year-old daughter to the non-Muslim mother, M Indira Gandhi, the court also found the father guilty of contempt. Judge Lee Swee Seng said failure to hand over the child would require the police to enforce a warrant of arrest on Pathmanathan for committing contempt and not abiding by the court order. Reading out his two-and-a-half hour judgment, Justice Lee said the supervisory jurisdiction of the civil High Court is based on the fact that a syariah court decision cannot bind a non-Muslim party in a marriage. In Sabah, we are one big family with Christians and Muslims living in peace and harmony side by side even within the same family. But we want to make it very plain that for the past 50 years we have been in Malaysia, we have been facing threats from extreme political Islam to systematically eradicate our cultural heritage as Christians and our ethnicity as Anak Negeri, the true sons and daughters of Sabah. Some call this a form of genocide. •	Facilitate networking among lawyers and Christian leaders who are addressing current issues and development pertaining to religious liberty and Islamization and dhimminization of non-Muslims.